On Wednesday, May 23, 2012, PENNSYLVANIA ASSOCIATION FOR EDUCATIONAL COMMUNICATIONS & TECHNOLOGY (PAECT) SouthWestern Chapter held its first Regional Event. This “Taste of Technology” TECH and TELL was held at St. Louise de Marillac School in (Upper St. Clair) Pittsburgh, PA from 5:00 P.M. – 7:00 P.M.
Zee Ann Poerio, Technology Teacher for K-8 at St. Louise de Marillac, was the host and event chair. Ken Klase, principal of St. Louise de Marillac School welcomed everyone and Dr. Shirley Campbell, Past President of PAECT, thanked everyone for attending. Following a light technology themed dinner with APPetizers, BYTE sized sandwiches, computer potato CHIPS to munch, and COOKIES, the attendees were invited to a visit a student showcase which featured technology from Carnegie Mellon University’s CREATE Lab. http://www.cmucreatelab.org/ An exhibit featuring a Robotic Ancient Coin made by the STL Student Technology Team using the ARTS & BOTS (formerly Robot Diaries) - Hummingbird Kit was displayed for human robot interaction. Also, 8th grade student, Tom W., invited attendees to attempt challenges he programmed for the FINCH, another robotic device. A GigaPan was on display along with a large print for attendees to post comments. Jillian G. and Francesca G., eighth grade students, also volunteered at the event. They demonstrated how Turning Technologies http://www.turningtechnologies.com/ response devices or “clickers” can be used in the classroom, and they assisted in registering teachers with EDMODO http://www.edmodo.com/ accounts to prepare for the workshop. Dan Plesco of Direct Tech Solutions explained the benefits of using a Meraki Wireless Access Point. The access point was installed that day and attendees were able to see how quickly schools could benefit from the technology. SWPAECT members presented the attendees with a “taste of technology” that they could put to use in the upcoming school year. Attendees learned how to power their classes with EDMODO http://www.edmodo.com/ (Zee Ann Poerio, K-8 Technology Teacher), engage their students with the new SMART Notebook 11 http://smarttech.com/notebook11 (Brandie Boback, Certified SMART Trainer), and use Twitter http://twitter.com/ for the Classroom and PD (Silvina Orsatti, IT Specialist.) The session ended with a TECH & TELL where attendees shared their favorite web tools. Special thanks to Dom Salvucci who joined us via SKYPE to share his experiences with Edmodo, Jana Baxter of SW PAECT, St. Louise de Marillac School administration and staff, and Theresa Enyeart, Toni Luvara, and Jean Rowles for their help on the day of the event. This event was FREE for PAECT Members and $5.00 for Non–Members. Attendees received PA ACT 48 credit and left with “cookies” (to eat) and great ideas to share with their colleagues and use immediately in their classrooms. The June Harless Center for Rural Educational Research and Development, College of Education at Marshall University, held a year-end celebration showcasing Harless CREATE Satellite projects on May 17, 2012 from 6-8 in the Memorial Student Center’s Don Morris Room. Featured projects included: the GigaPan Outreach Project, Arts and Bots, Hear Me, and Message From Me. In addition, a new WaterBot project was introduced. GigaPan enables students to take GigaPan panoramic images of their communities and activities and share them with peers across the world. Arts and Bots is a customized robot designed to integrate technology, literature, and history through the use of art supplies, circuit boards, lights, motors and sensors. Hear Me seeks to amplify kids voices using media and technology to create a world where kids are heard, acknowledged and understood, thereby giving them the power to inspire change in their lives, communities and the world. WaterBot is a citizen scientist project that prototypes a low-cost, easy and mobile method to monitor water quality, empowering communities, educators and children to monitor their watershed systems. The Harless CREATE Satellite grant, which was funded by the Claude Worthington Benedum Foundation, provides rural Appalachian schools continuous and seamless access to technologies, educational resources and ideas generated at the CREATE Lab in Pittsburgh. In addition it enabled teachers to integrate cutting edge technology into existing curriculum. Schools showcasing projects are from the Marshall University Professional Development Partnership Schools and include the Early Education STEM Center, Huntington High, Kellogg, Guyandotte and Ceredo Elementary schools, Beverly Hills, Milton, Barboursville Middle schools, as well as Cherry River Elementary in Nicholas county, Beverly Elementary in Randolph county and South Point High School in Ohio. The CREATE Lab is considering a project tying social media to tracking personal fitness. Last Friday-- 27 May-- we boarded a school bus to travel to Carnegie Mellon University's CREATE Lab. My 20 kindergarten students, carrying small suitcases full of circuit-building materials, were set to present their learning to a room full of CREATE Lab researchers. Mr. Jeremy (Jeremy Boyle, teaching artist who has worked with us all school year) met us outside and we walked together to the Lab meeting room. I have no idea what my students thought college was going to be like. 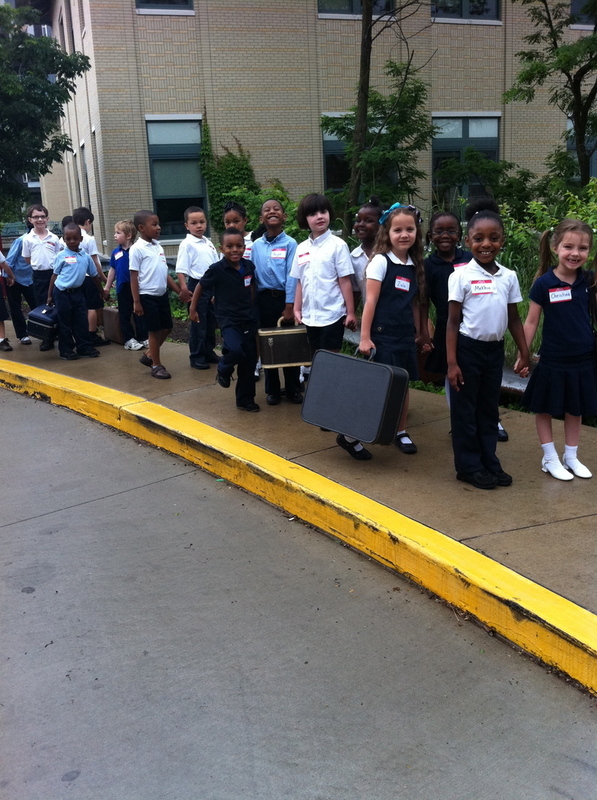 We had been talking about it for weeks, but all they knew was that they were "going to college" for a day of teaching and learning. Once we settled into the meeting room, looked around, asked initial questions and shook hands to greet our new friends, children began their presentations. In partners, children opened their suitcases and taught the group something they have learned from our integrated project work this year, what Mr. Jeremy and I have named "Innovation Time." Topics included: What is a circuit? - What can be inside a toy? - What is a switch? - What can be conductive? - What is power? - What happens when you add more electrical power? - What can you do if you don't have more power? (series-parallel circuits) - When does polarity matter? (with a motor and with an LED) - What is a potentiometer? As children shared what they know about circuits they became more and more comfortable with the idea of presenting to an audience (beyond our classroom). They asked, "Does anyone have any questions?" and if asked a question that other children in the class planned to teach about (a question about polarity, for example, came up early in the group presentation), the other children would say "someone else is going to teach that" or "don't tell them, shhh" (almost like it was secret what they were presenting to this group of researchers). What was evident through children's presentation of their learning was that young children (ages 5 and 6) have the capacity to know a lot about circuits and can appropriate what they know for their own expressions. With materials that are easy for small hands to use and a learning environment that promotes both exploration and expression, robotics content that may seem appropriate only for older children is not only appropriate for children of this age group, but is profoundly engaging and empowering. Children's presentation of learning was only the first hour and a half of our day. Next, children got to learn about the GigaPan project, visit the Snakebots Lab, had a lunch meeting to explore the traits that make a robot a robot, take a tour of the High Bay and the Machine Shop (Illah told all of us to put our hands in our pockets) and finally we all walked across the street to learn about the ChargeCar. This was a life-changing day for my students. We are still talking about all that we learned. Children are drawing and writing in books that tell all about what they did and learned. My students will continue to think about what is inside of things and how things work and this project (and this special day at college) have instilled in them the belief that they have the power to change how things are made. They can create new circuits to do new things, things that help the world-- bring people together, help the environment, and anything else they can imagine. An enormous thank you to everyone in the CREATE Lab for this fabulous learning opportunity. With the double aim of making robots accessible to non-experts and introducing high-schoolers to academics and student life at CMU, we invited a group of students from The Future is Mine to take a tour of the Gates-Hillman Center for Computer Science, led by experts on and inhabitants of the building - Facilities Director Jim Skees, Professor of Art Bob Bingham, and Masters’ Student David Adamson. Each tour guide provided their unique perspective on and stories of the space to a subset of the students. Afterward, we introduced them to Cobot, another inhabitant of the Gates Cetner - Cobot is an autonomous service robot, designed for delivering mail and messages, and more importantly accompanying visitors, throughout the building. The students collaborated on scripting a tour that Cobot would deliver to later visitors, drawing from their tour experiences to tell their own story of the place, through words and images and movement. Minutes after they were done writing, the students were led on another tour - the very one they had written, and Cobot was their guide. They giggled at its synthesized voice and occasional wrong turns, and proudly spotted the parts of the tour that were theirs. Cobot delivered the TFIM tour to a group of younger students a few weeks later - they loved it! The students’ work will live on as part of a set of robot tours available to CMU visitors. Just wanted to thank everyone for a great visit, tour, and learning experience with The Future is Mine student leadership group. As a mentor, it is always rewarding to see students see and learn about something new in the world of technology. The experience with the tourbot was so innovative. It really opened my eyes to the wonderful and useful ways that robots will someday be used in our everyday lives. I congratulate all of you at CMU’s Create lab for thinking “outside the box”. Thanks again for a very informative and fun day!